This book suggests that we should turn away from drug illegalization; that we should do so not because drugs are good, but because what follows as a result of illegalization and the accompanying Supply Oriented Drug Policies (SODPs), is much worse than what follows from a liberal approach. Although this book is on a depressing topic, the text has been designed to be entertaining: you will be surprised. Against an untraditional and provocative background - man as a weakened species and in need of certainties in a world that offers ever less such – the reader is guided to find out whether illegalization is likely to bring about anything positive according to his or her own beliefs and values. The author, Andres Laszlo Jr., believes that he has successfully corroborated a “no” in response to this question. In addition, he claims that he has come up with some interesting new or at least unusual thoughts. 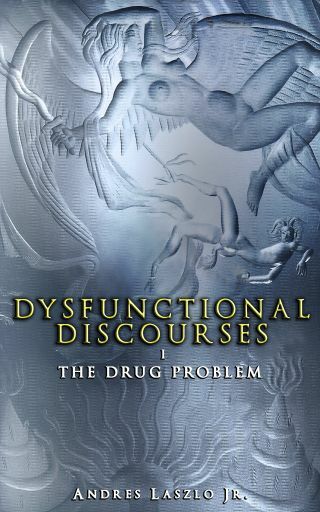 Some main conclusions of these books are that our present focus on SODPs is at best misguided, that a partial legalization is an option well worth consideration, and that better understanding of the drug problem could well be had by asking; “Why are drugs illegal?” This is how Laszlo's academic ex-supervisor commented the text: “The writing of Andres Laszlo is not for everyone. He challenges, pushes, provokes, and dances wildly in that strange borderline between cool analytics and expressionistic creativity. This said, he has written a book on drugs, drug use, drug policy and drug experience that deserves to be taken seriously, as a challenge, a push, a provocation and an orgiastic dance of intellectual energy. It will not be to everyone’s liking, and takes a certain pleasure out of just this fact.” Professor Alf Rehn ABSTRACT Chapter 1 outlines the overall approach of the book and provides a background to the drug problem. Chapters 2 and 3 give an explanation as to why we take drugs while giving more background information, necessary in order to benefit from the rest of this book and the following. Chapter 4 outlines traditionally recognized drug harms while asking whether drug illegality or drug use is the main cause of the drug problem. Chapter 5 speculates about what the different actors on the drug stage would have gotten up to without illegality and the subsequent SODPs. Chapters 6 and 7, by introducing the terms “convection” (flow of surplus capital) and “conduction” (interpersonal relationships), suggest a novel way of thinking about how illegalization and SODPs, through the racket’s intrinsic immorality, corrupts. Chapter 8 guides the reader to answer the question “What should I think about SODP’s chances of success?” Chapter 9 presents the stage upon which the drug problem is enacted and “its” three dominant forces - those of supply, demand, and law – together with the weaponry each force has at its disposal, so as to once more put the reader in a position to judge SODP’s chances to succeed. Chapters 10 and 11 introduce some additional arguments and the second book ends by asking whether we really would accept the sine qua non for a SODP to succeed.